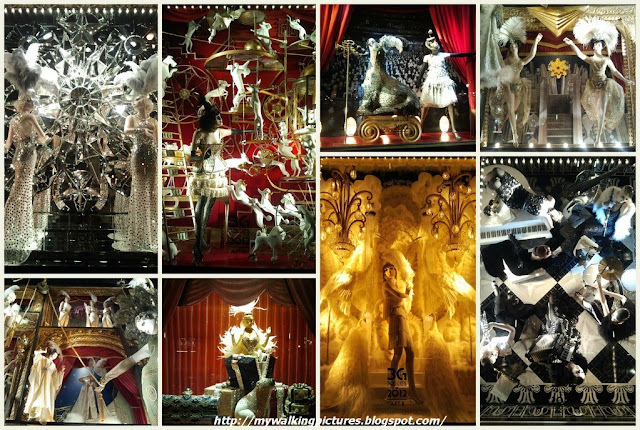 Christmas time in New York City is like no other .. the sights, the sounds, and then there are the holiday show windows. Each year is different and the stores' creative staff really make each year's decorations even better than the ones before. And we all know what the reply of the editor of The Sun was ..
"Yes, VIRGINIA, there is a Santa Claus. He exists as certainly as love and generosity and devotion exist, and you know that they abound and give to your life its highest beauty and joy. Alas! how dreary would be the world if there were no Santa Claus. It would be as dreary as if there were no VIRGINIAS. There would be no childlike faith then, no poetry, no romance to make tolerable this existence." 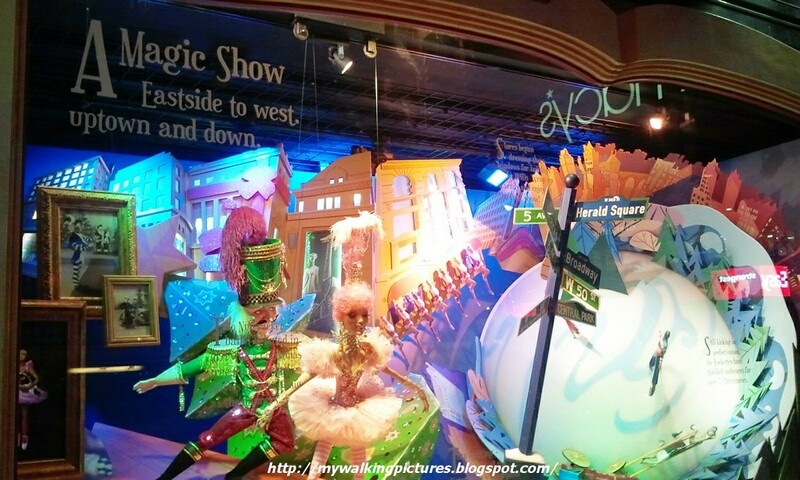 On the Broadway side of the store are the main show windows. 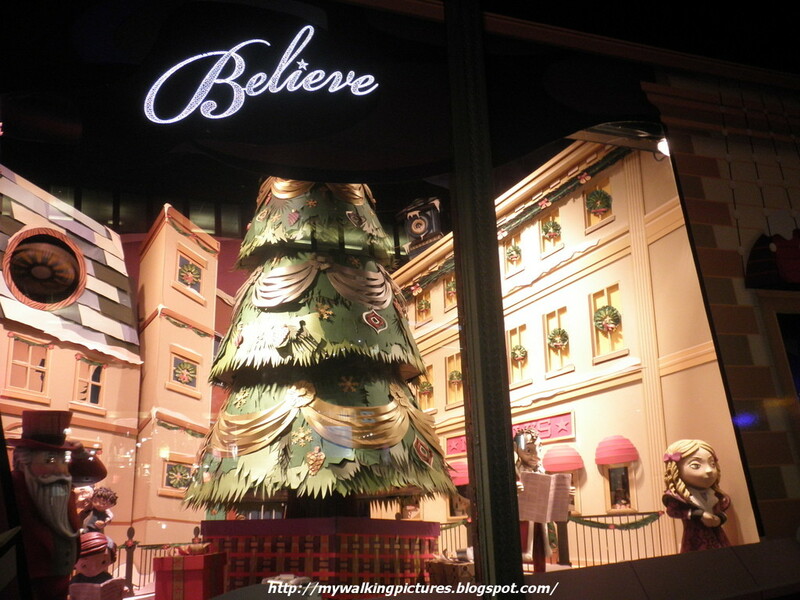 This year's theme is about The Magic of Christmas. The first show window is about New York City, a magical city where marvels unfold. Some of the iconic New York symbols are seen on the window, like the Men at Lunch, the Statue of Liberty and the Brooklyn Bridge. Fashion from the 70's to the 90's are also shown on a rotating basis. 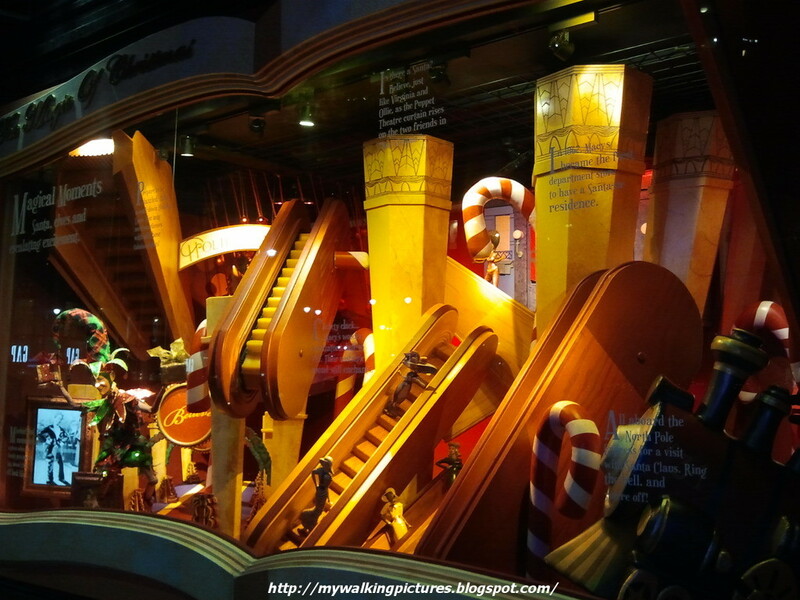 The second show window features the iconic wooden escalators of the Macy's 34th Street flagship store. 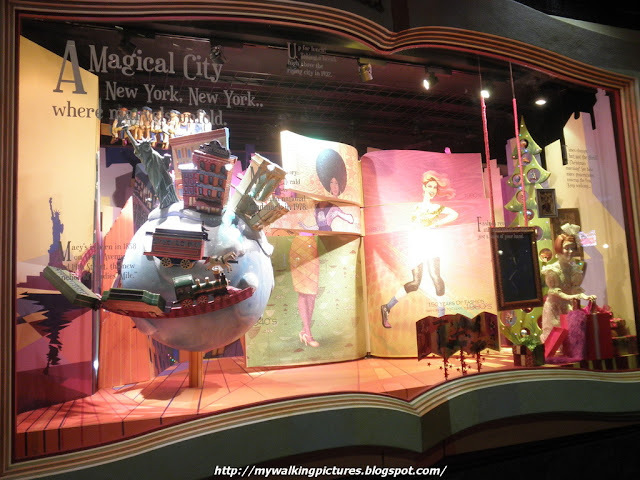 The third show window shows some of the shows/events during the season that you can see around the city, like the Rockettes of the Radio City Christmas Spectacular, as well as skating in Central Park. Macy's Thanksgiving Parade balloons are featured on the next show window. The new balloon Rex the Happy Dragon is poking its head behind Harold the Fireman. 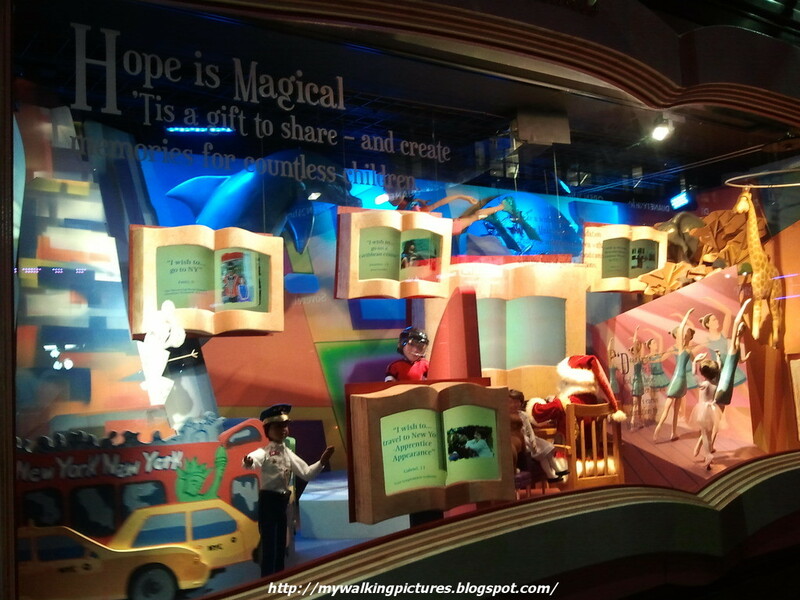 "Hope is magical" is the message of the next show window which shows the wishes of the children on what they want to be when they grow up. The last show window features several television screens showing past Thanksgiving Day parades as well as other places around the city. 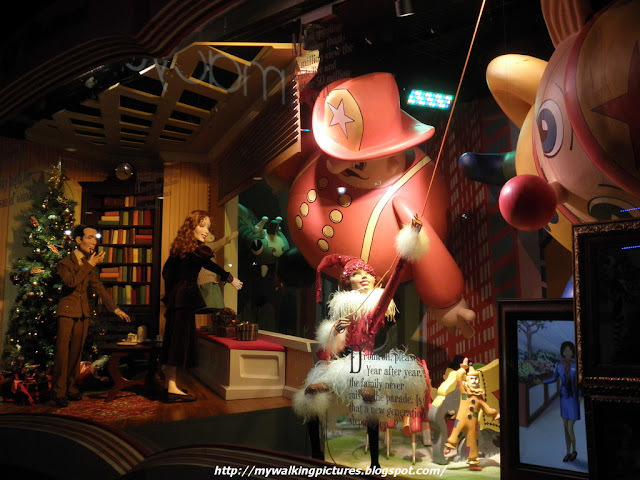 At the corner of the show window is this message ..
Lord & Taylor was the first retailer to present animated holiday windows and this year is the store's 75th annual holiday window. 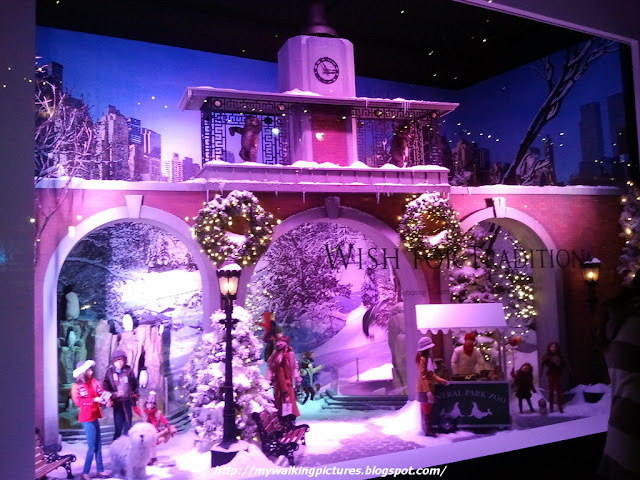 "The annual holiday windows are our gift to New York City and I'm excited to share this special experience with our customers," said Bonnie Brooks, President of Hudson's Bay Company. 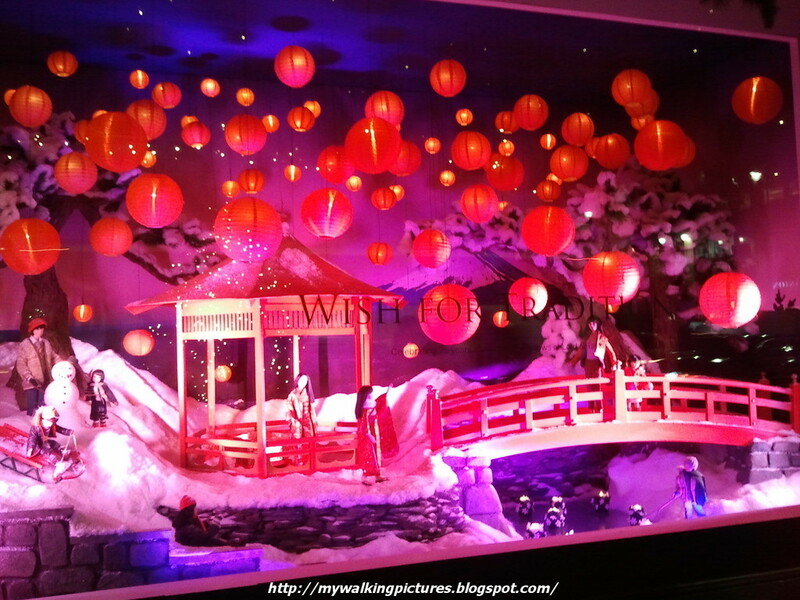 "This year's windows celebrate special holiday traditions from around the world." 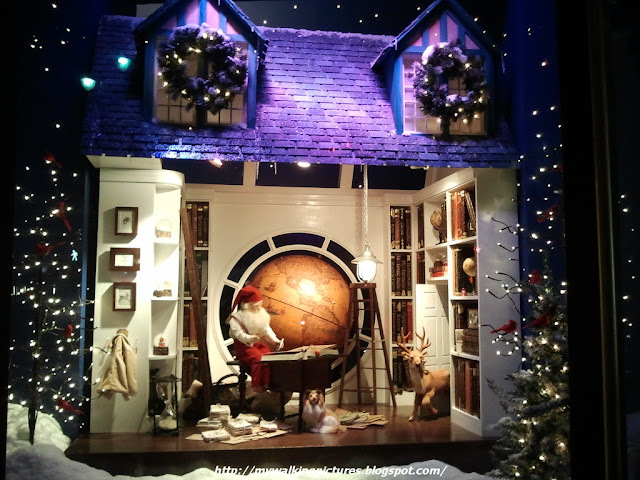 The corner show window shows a modern day Santa's workshop, where the window features a rotating globe as a backdrop, and Santa planning his trip, surrounded by books full of children's wishes to be fulfilled. 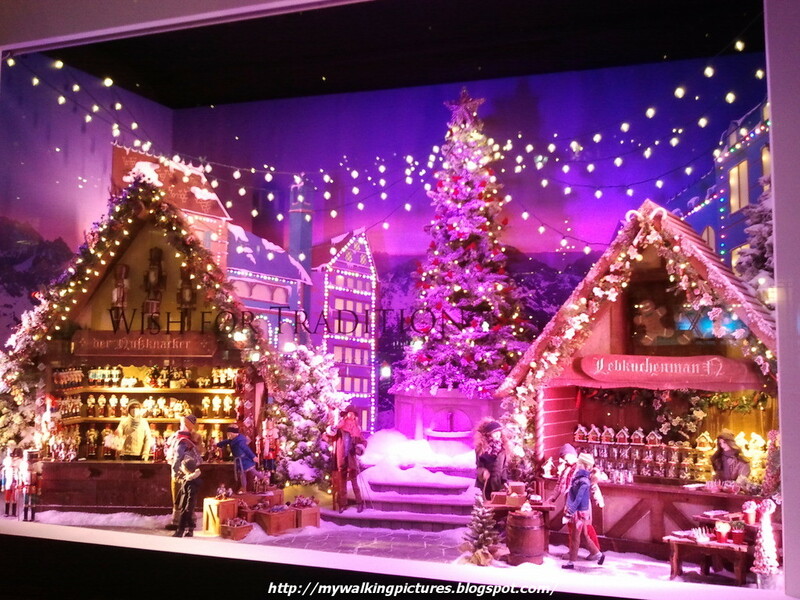 The next show window shows snow-covered mountains, and a town marketplace selling traditional holiday figures such as miniature nutcrackers and animated gingerbread men. The next stop on Santa's journey is New York City, featuring the Central Park Zoo. I tried to get a pic of the seals at the back but they were moving too fast for my phone cam but the Delacorte Clock is prominently featured. The next show window features a traditional clock tower and an intimate celebration with friends and family in a furnished loft with a rotating clock. The final show window brings Santa to Asia, and this window is illustrated by vibrant red lanterns and a scenic snow-covered bridge, highlighting the tradition in which the lanterns are released for good fortune and luck. 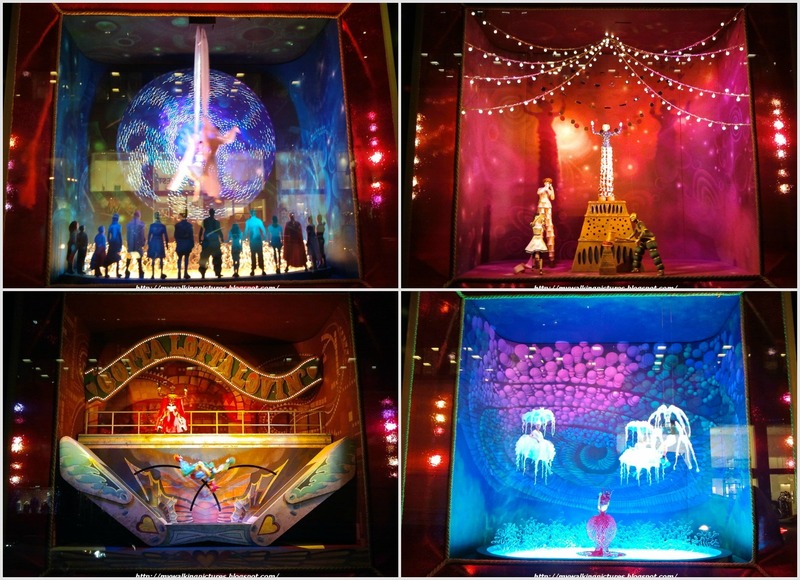 The show windows of Bloomingdale's showcase animated acrobats in celebration of the upcoming 3D movie, Cirque Du Soleil Worlds Away, which opens on Friday, December 21. Here's a collage of the rest of the windows ..
At the other side of the store's doors are interactive windows where you peek into a porthole and your photo is snapped in a cartoon holiday scene. 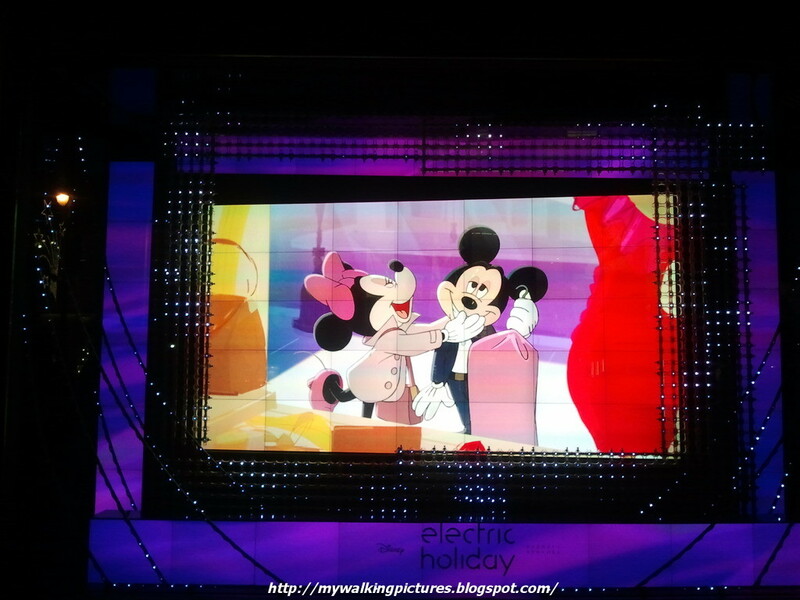 The pics are then displayed on Bloomingdale's Facebook page. It was fun! 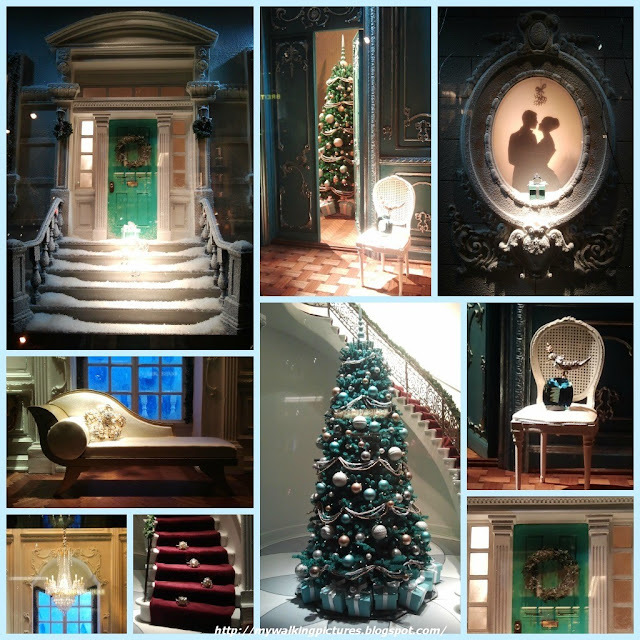 The holiday show windows of Tiffany & Co features the front door and several rooms of a swanky NYC townhouse decked for Christmas. In the collage I made you can easily see the tiffany blue box featured on some of the windows. 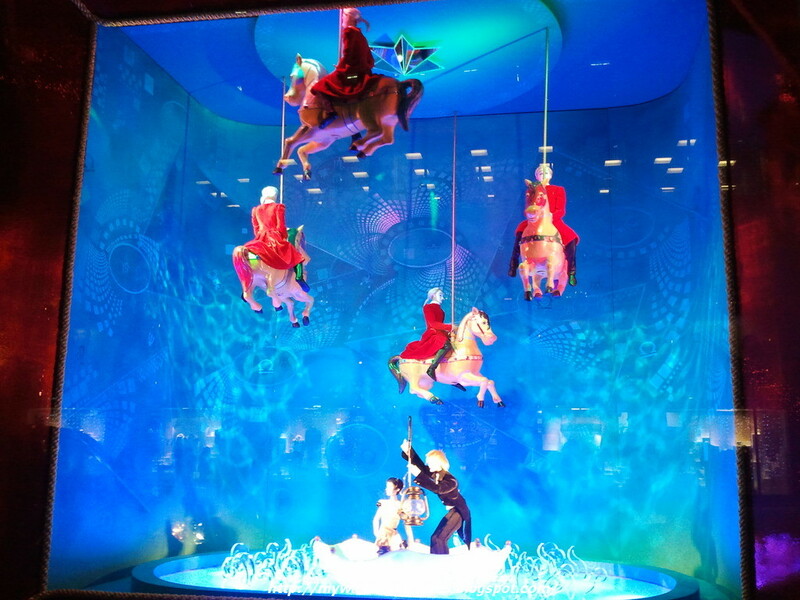 Like Tiffany & Co, Bergdorf Goodman is also along Fifth Avenue. The store's holiday show windows always attract a crowd as they are unique and eye-catching. 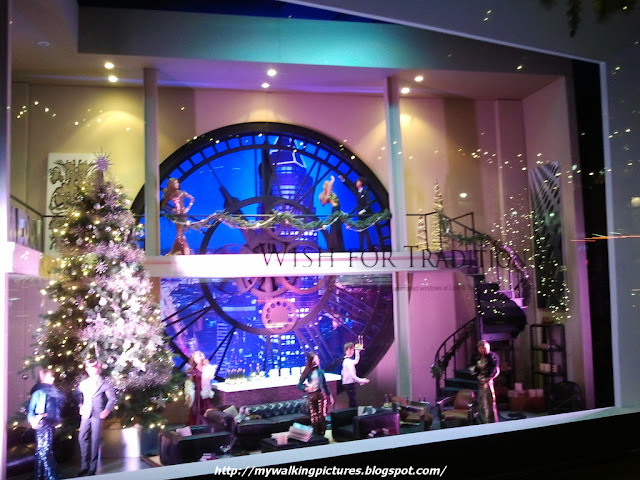 Called The BG Follies of 2012, the windows were inspired by entertainments such as the Ziegfeld Follies, Vaudeville revues and Busby Berkeley’s Hollywood musicals of the 1930s. They’re a miniature revival of classic Art Deco style, touching upon the fantasy shows of the time — the solo act, the duo, group performance, novelty act (starring daredevil dogs) and more. 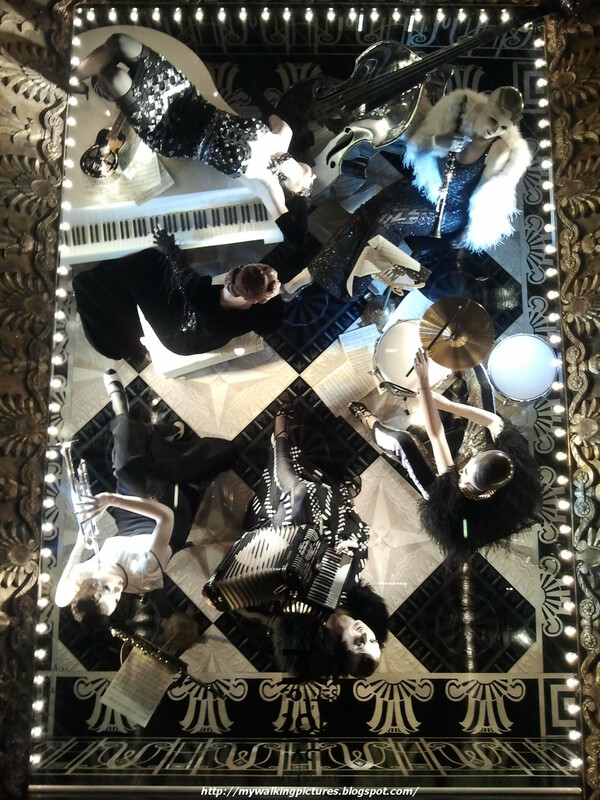 Here's one of the show windows, a black and white homage to Marilyn Monroe in Billy Wilder’s Some Like It Hot. The site I linked above have great pics of the show windows. Here's another collage I made, this time the Bergdorf Goodman windows. 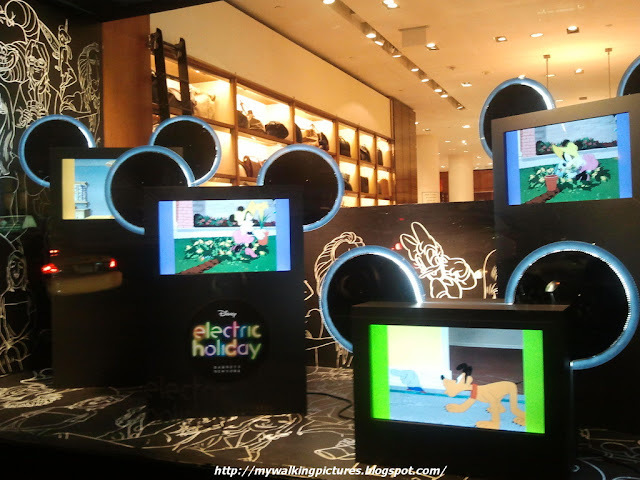 Barney's 2012 holiday show windows has the theme “Electric Holiday,” showing a short animated film that follows Minnie Mouse as she longingly window shops at Barneys, only to find herself eventually walking the runway along with some of her best cartoon friends. I tried to take a vid but people were constantly passing by so my video is not that good. Here's the official vid from Barney's, try to look for Goofy, I'm sure you'll be pleasantly surprised. 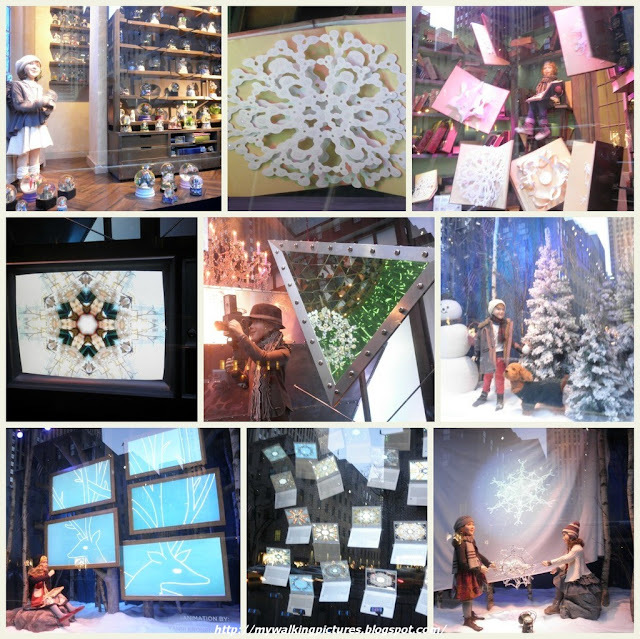 This year's holiday show windows for Sak's feature the making of snowflakes. 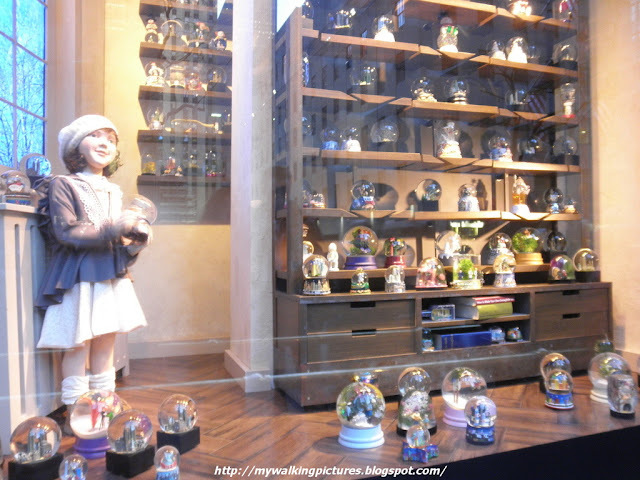 The first show window features several snow globes and I think the child mannequin was asking how snow flakes came to be. The next windows show some scenes about the snowflakes' origins. 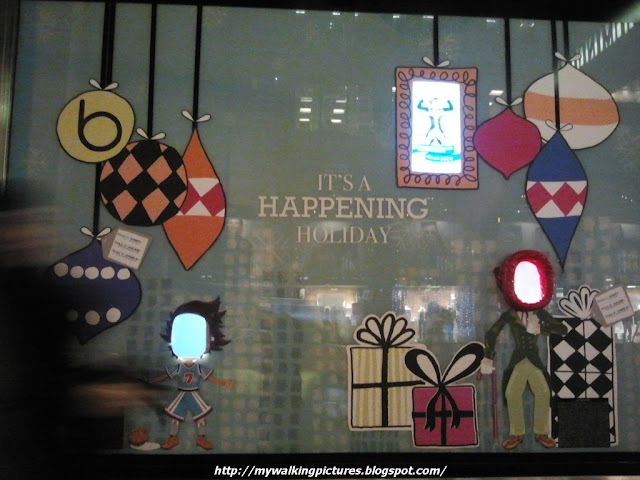 As has been the tradition since 2005, Sak's Fifth Avenue has a light show on the entire facade of the building. 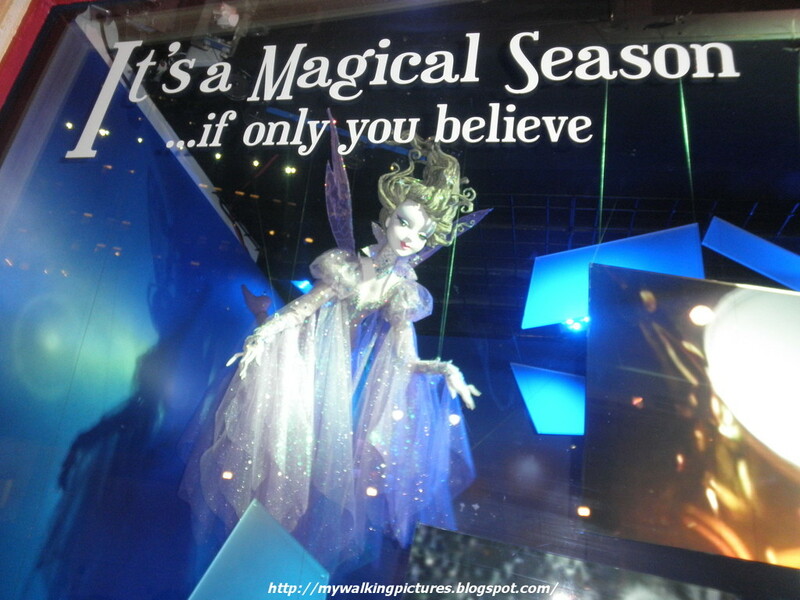 This year the two-minute show, which runs from 5 to 10 pm until January 7, 2013, is complemented with a shaggy, bigfoot-like character called Yeti within wintry scenes in windows involving flurries, snowfalls and mini versions of the abominable snowman. Here's the official video, enjoy!